Noceto is located close to Lucignano, in the heart of Tuscany, and is the ideal destination for a relaxing holiday. It's just a few kilometres from Arezzo, Siena and Florence, and Umbria is nearby as well. 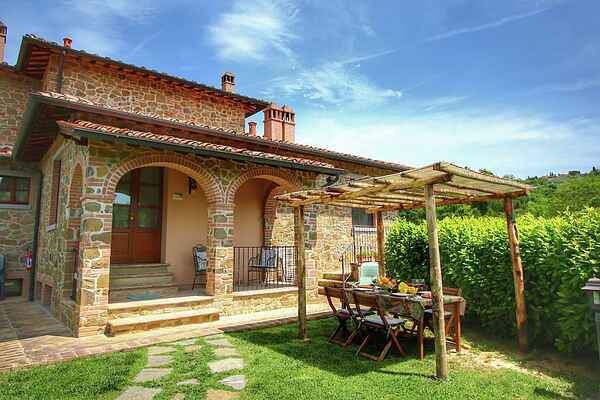 The house was built just recently, but is fully furnished in the traditional Tuscan style. There is no TV, so you have plenty of time to enjoy a good book and glass of Tuscan wine. The house is surrounded by a large garden with fruit trees, a swimming pool, a garden hut and a barbecue grill and looks out across the beautiful Tuscan hills. This is a family-run estate and the owners are happy to receive guests at any time of year. It's the perfect place for a quiet country holiday and makes a good base for excursions to art destinations and for hikes in the surrounding nature. There is a big lovely common area where you can have breakfast or dinner, which can be prepared by the owner upon request. The owner will also organise a cooking class upon request, where you can learn to cook traditional Tuscan dishes for example, or pizza. This apartment is not suitable for babies in connection with small bedroom and 2 stairs. Our region is well-known for being one of the most appreciated by tourists from all over the world. The central position of the Agriturismo allows our guests to truly live the beauty of the places all around, which can be easily reached.nn nnSiena: a real jewel of a city, Siena is about 45 kilometers far from Lucignano. The city is mostly known for the Palio, runned every year in August and July, as well as for its historical centre, so romantic for magical walks.nn nnMontepulciano: This little city and the surrounding countryside have fame for the wealth of excellent vineyards from where we can obtain the Vino Nobile di Montepulciano DOCG . Its ancient origins and its nature of City of art are the reasons for its being called “the Pearl of the Renaissance”.n n nPienza: World Heritage Site, Pienza is a small village in southern Tuscany, in the breathtaking Val d' Orcia, World Heritage centre as well. Very close to Montepulciano and Montalcino, where you can find central Italy finest wine, Pienza is the creation of humanist Enea Silvio Piccolomini and due to its strategic position on top of a hill you can admire all the charm of the valley.n n nFirenze: Firenze is popular for its history. Considered the birthplace of the Renaissance and called \"the Athens of the Middle Ages\", Firenze shows all the beauty of its Roman origins, from Ponte Vecchio to Piazza della Signoria. Don’t miss a visit to Piazzale Michelangelo, which has the most famous panoramic view over the city.n nn nnThe Golden TreennThe Golden Tree, also called The Love Tree, is a golden artwork kept in a large glass case in the museum in Lucignano. Made by Ugolino da Vieri and Gabriel d’Antonio in the incredible period of time of 121 years, it is a very original reliquary, being the only one realized with a tree shape.nAccording to an ancient tradition, this tree brings happiness to people in love and it's a custom that a bride and her groom promise each other eternal fidelity and love at this golden tree..nnLucignano is a small medieval village in Valdichiana and the sanctuary is a tree, commonly known as the Golden Tree or The Love Tree. It is a golden artwork and it is kept in a large glass case in the museum in Lucignano. According to an ancient tradition, this tree brings happiness to people in love and it's a custom that a bride and groom promise each other eternal fidelity and love at this golden tree.